Bibury, a small village in Gloucestershire, England, is perhaps the quintessential Cotswold village. The artist and craftsman William Morris called Bibury "the most beautiful village in England" at the sight of the village's charm. Its honey-coloured 17th-century stone cottages with steep pitched roofs once provided housing for weavers who supplied cloth for fulling at nearby Arlington Mill. The mill now houses a folk and agricultural museum, containing a room dedicated to Morris. The River Coln flows through the village, alongside the main street. Bibury attractions include a trout farm (1902) where some 10 million rainbow trout are spawned yearly. The trout can be sampled at the Catherine Wheel, a small inn and pub. Bibury seems to be visited by tourists all year round. In the summer months parking can be tricky as cars compete with coaches for the limited parking spaces in the small car park and the on-street parking. Make sure you take your camera so that you can take photographs of Arlington Row, the picturesque bridge over the river Coln, Bibury Trout Farm, Arlington Mill (now closed) and the other Cotswold stone cottages in the village. There are miles and miles of countryside walks in the area, so we suggest that you purchase one of the Cotswold Walks books that are on sale in book shops and on the internet to help you plan your walk. 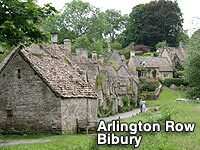 For Bibury holiday cottages try the Bibury website. A working trout farm in the heart of beautiful Bibury. The Romans and the Saxons can be forgiven for not having the foresight to make Bibury car and bus friendly! There is a limited amount of free roadside parking available on "The Street" and a small free car park opposite Bibury Trout Farm. Out of season visitors to Bibury won't have a problem parking, but visitors in the height of the season may have to wait for a vacant space at peak times. If you look at the photo of Bibury near the top of this page you can just see part of the car park on the right hand side. We think horse parking is free! Jobs365 - Find your next job online, 365 day a year!